It is no secret that I, Molly Stillman, LOVE Pinterest. I can easily burn a few hours on Pinterest and not even blink. I’ve talked about Pinterest (somewhat ad nauseum) in my social media tips of the week and I’ve mentioned how companies and businesses (specifically, AV people) can better use and integrate the social network into their marketing and social media strategies. 1. VERTICAL images make GREAT pinnable images If you look at the those images from the top Home Decor images in 2013, every single one of them is a “vertical” image – meaning the height is longer than the width of the image. Vertical images on Pinterest show up LARGER than all other images making them extremely noticeable, and thus, more likely to get repinned. So, what can you take away from this? When you’re posting / sharing an article or post on your own site or blog, consider creating or making the first image at the top a VERTICAL image so it’s easily pinnable. Or, when you’re pinning something yourself, consider pinning the vertical image versus pinning the horizontal image. 2. TEXT on an image explains what you’re pinning! Almost every popular craft / DIY / recipe / tutorial / how-to pin has TEXT on the image that explicitly states what’s behind the pin. What can you take away from this? If you’re sharing a how-to or a DIY or a post on your site or blog that is informative in ANY way, considering adding TEXT to the first image with the TITLE of the post. That way, when you or someone else pins the image from the post, pinners know EXACTLY what they’re getting. Look at those technology pins. Every single one of them is BOLD, clear, and strong. And the fact is, ALL good pins have a bold, clear, and strong image behind them. What can you take away from this? Make sure you’re including a BOLD, clear, and strong image with every post you make on your blog or site. It makes it easier to pin and easier for people to want to RE-PIN or share. Pinterest is ALL about visuals! You could have a GREAT article, but if there’s no GREAT IMAGE to go along with it, then it’s basically a dud. 4. Be a cute animal. Okay, there’s nothing really to take away from this. We can’t all be adorable creatures. This is more just for fun. What about you? 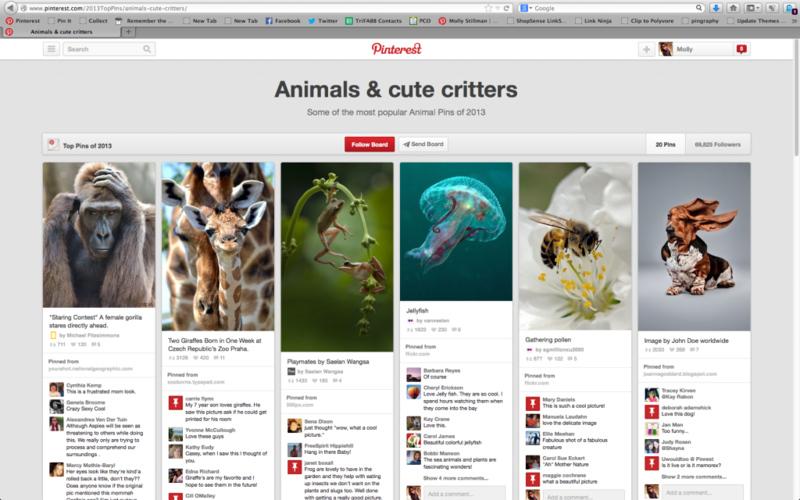 Are you a Pinterest fan? What common threads do YOU see with the Top Pins of 2013? Previous Previous post: SURVEY: Which Tradeshows Are You Attending in 2014?